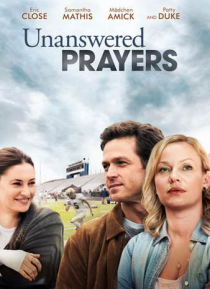 From Executive Producers Garth Brooks and Lisa A. Sanderson comes the inspirational Lifetime drama based on the hit song, UNANSWERED PRAYERS. Eric Close and Samantha Mathis star in this riveting drama about an all-American family man whose commitment is tested when his fantasy love from high school comes back into his life. Is this just a temptation, or is this an answer to his prayer? A thought-p… rovoking story about marriage, family, community and faith.